"Presidents are selected, not elected." I remember when the Constitution Party candidate for the presidency of the United States in 2004 told me, "If you were to take Ronald Reagan and put him into a room, and Jesus Christ into another room, that room with Ronald would be packed with followers, whereas Jesus would be left alone." How right on was his statement? Let me take you back to the 2012 election cycle at the Democratic National Convention where it was reported that Republicans were calling out the Democrats for removing references to "God" from their party platform. While the Democrats refused, God the Republicans gave it over to their foreign and false gods (Deuteronomy 10:17). Earlier in the campaign season, we saw a woman introducing Hillary Clinton and citing the words from the Pledge of Allegiance, but purposefully ignoring "under God." Today's Republicans are yesterday's Democrats! Secondly, for them that have been dumbed down to believe that we have a two, three or four party system, here is a newsflash: We have one Constitution; we do not have a two, three or four party system. There's no better way than to divide and conquer, is there? This is the mentality taken on by those who look no further than what they are told. This all reminds me of when Christ was being delivered up by the transgressors of God's Law (Exodus 20; 1 John 3:4) to be crucified (John 8:46) by the religious hypocrites and the Herodians (Mark 8:15). These people asked for a guilty criminal to be released while delivering up an innocent man, namely the Son of God, in an attempt to justify themselves before one another. What they did not realize is that they were bringing judgment upon themselves (Matthew 27:25). 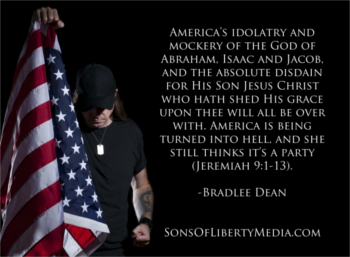 Soon enough, America's idolatry and mockery of the God of Abraham, Isaac and Jacob, and the absolute disdain for His Son Jesus Christ who hath shed His grace upon thee will all be over with. America is being turned into hell, and she still thinks it's a party (Jeremiah 9:1-13).